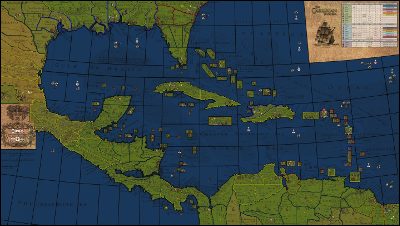 Set in the 1700s Caribbean where European powers seek to dominate. Join the Franco-Dutch-Danish or the Anglo-Spanish-Swedish alliance. Tackle the menace of local savage indians as well as harassing pirates. Receive periodic military assistance from the European homelands. Use several types of ground units, ships, fortifications and officers. Win the trade war by controlling productive lands and convoy zones.